On my way to NYC with the most amazing crew ever plus CHALLENGE NR. 1! Austrian Airlines announced on their blog that they are looking for great bloggers to join them on a trip to New York City in July. Flight and hotel covered by them! After some thinking and creating a strategy that would work for me I applied with my “A Dirndl across the world” story. Two of the finalists will be going to NYC – one on the plane to JFK and one to EWR. They will compete in various challenges there and the winner is getting 50,000 miles and a free credit card for a year. My goal was it to make it to the top two bloggers. As you may have seen on my facebook page and also on my personal account that I asked you to share, like, tweet, +1 and leave comments on my story on the blog of Austrian Airlines. That ranking plus the decision of the jury made the selection. You crowned me as one of your favourite bloggers – what an honor! Thank you and Danke to each and every one of you! We are happy to announce that you won our hearts with your charm and your presentation. 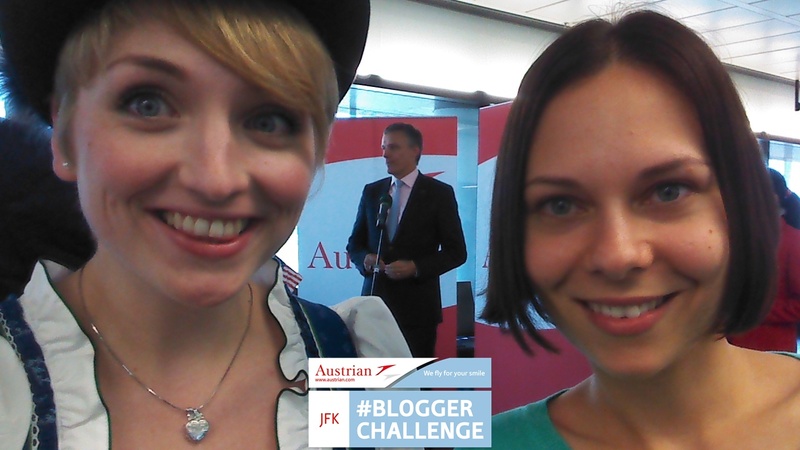 Therefore we invite you cordially to join the AUSTRIAN AIRLINES BLOGGER CHALLENGE. We’ll need some further information about you to book the flights to New York for you. You should have seen me dancing through the kitchen that night! I was stunned – I made it – you made it happen for me! You can’t imagine how grateful I am! Which airport will I be flying to? JFK or EWR? I felt a lot of excitement and when I knew who was the other finalist joining me on the trip to New York I was calmer again. No one other than Jovana from Serbia aka the dreamoholic! Final packing and preparations for the upcoming trip! In the morning I took the train to Vienna to meet with some friends and afterwards head to the Airport for the first meeting with Jovana and Austrian Airlines. Gosh was I excited about that! I managed to get to the airport in time to pick up Jovana and check in at the hotel there. After a quick shower I threw on my dirndl and we went to see the online marketing team of AUA. We had a lovely time getting down to the details and clearing everything. Plus we got information for the challenges that we’d have to do! I’m not telling you much more, but it will be some great fun over there in the States! We headed back to the city centre of Vienna afterwards to wander through the streets and get dinner. As always we got to bed way to late and neither Jovana nor I managed to sleep or sleep well that night because of the tension and not knowing what will happen the next day! Tuesday 2nd July 2014 – the big day! Waking up at 6am has never made it on my list of favourite things to do, but anyway today was going to be special! Had a quick breakfast at the hotel and then headed to the airport! Collected the boarding pass and quick baggage drop off – then we met again with the Austrian Airlines Online Marketing Team to head towards the Business Lounge. I’ve never waited that little time at security check – plus I got all the attention because I am wearing my dirndl right now! Jovana had to do an extra round in security because she was a selectee – meaning thoroughly and advanced security check that took about 15 minutes! In the business lounge they offered hot dogs and doughnuts, because of the first ever flight of AUA to Newark (EWR). We head to the gate where Jovana’s aircraft will leave in less than an hour. There was a lot of media going on there and Mr. Karsten Benz, CCO and member of the AUA board said a few words because of this first time flight! We also got to meet, shake hands and take some pictures with him. Her plane departed a bit before mine so I said goodbye to her – I’ll see her again in a couple of hours in New York City at our hotel! I’m not gonna lie but: I have probably never met a cabin crew that nice and supportive that the one on my flight to JFK! Just yesterday I was asked what I wanted to happen on this flight to NYC and I said: Meet and even sit next to some inspiring people with great stories to listen to and share some of own as well. Lucky me! I got to sit next to a wonderful Austrian girl who is visiting friends and family in Minnesota for a month and a charming New Yorker returning from his trip to Israel he was fun too although he slept almost the entire flight^^! I got to meet the pilots and visit them in their cockpit and the view was superb and simply stunning. I stayed there and chatted for about half an hour with the pilots and we had a lot of fun doing so 🙂 There’s usually only two pilots but on this flight there was a third one in training. All of them so super friendly and they answered to all of my questions with a smile! I didn’t go straight back to my seat: instead I got a look backstage! I got offered some champagne and who can say no to a glass of fine champagne?! Fortunately there was also some food left and so I got lucky again because one of the crew prepared vanilla ice cream with hot berries and whipped cream for me. O.O what a nice gesture! For the business class passengers they offer a wide selection of twelve different sorts of coffees and I got to pick one . Have you ever had a Maria Theresia? Me neither before today! It’s black coffee with orange liquor – apparently the empress had that when she ruled over Austria or it’s a simple but great marketing gag! On board the flight there: our bloggers will make their very own individual on-board announcement during the flight to #NYC to draw attention to themselves and their blog. ps. a huge Danke goes to Trachtenhaus Hiden for providing me this very special and stunning dirndl for my trip to New York City! Bin schon gespannt auf die nächsten Challenges 😉 Schaut aus als hättest du viel Spaß! Enjoy NY!